Solar Chimney Design - How Does It Work? A solar chimney, also referred to as a thermal chimney, is a basic design principle that uses the suns solar energy to improve ventilation in a building. The design focuses on passive ventilation, meaning it does not use a mechanical device like a fan to ventilate the building. This passive ventilation can accomplish a few things. First, it allows ventilation in buildings that may be "off the grid." Distant outhouses are a great example of structors that can benefit from a thermal chimney. Second, the design concept allows you to not only ventilate a building, it also allows an inexpensive way to cool a building without using any form of mechanical energy. Although many people have never heard of this type of passive ventilation or cooling method, the concept has actually been around for centuries. It was utilized by both the Persians in the Middle East and the Romans in Europe. So how exactly does the system work? To learn more lets look at the basic concept and design. Thermal Chimney - How Do They Work? A thermal chimney operates under the same principles as a fireplace in your home. For example, in a fireplace the heat from the fire causes the warm air to rise up the chimney and out of your home, commonly referred to as draft. This draft pulls cool fresh air into your home while the warm air rises, taking the smoke from the fire with it. A thermal chimney operates under the same basic concept, however, instead of the fire creating the heat, the sun is used to warm the chimney causing the air inside to rise. As the warm air inside the chimney rises, it creates the same draft effect that pulls cool fresh air into the building, resulting in passive ventilation. Although some of the advanced systems can get pretty involved using geothermal designs to cool the incoming air or Trombe walls to store the suns heat for use after sunset, the basic operation remains the same. 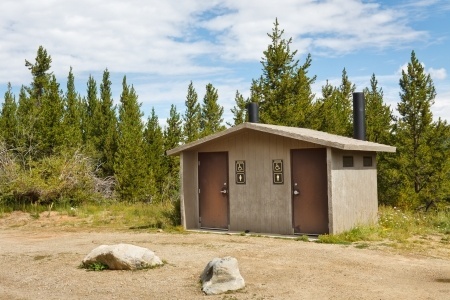 In its most simple design, a thermal chimney at your local state park outhouse is a great example of the concept. The chimney, typically painted black for maximum effectiveness should be positioned in a direction that receives the most direct afternoon sunlight. The chimney should extend past the roofline, allowing the air inside to rise creating draft. This draft pulls in fresh outside air, ventilating the outhouse. Other considerations such as insulated glazing and chimney size can improve the design making it more effective. While thermal chimney's are not common in every household, the basic principle of passive ventilation or cooling can have many possibilities. In a world where eco-friendly devices are appreciated, a solar chimney offers a great way to move air without using an energy consuming mechanical motor.